April is coming to a close and with it, my 5th “1 Game a Month” game must be called complete. Can I endlessly tinker with it? Sure. Did I sort of want the Blue Eyes to split apart into baby bad guys like those Zelda enemies? Yes. Should the game have ten more bosses? Should Level 12-13 be winnable? Will anyone other than me see the level 10 boss? Who knows, but it is April 3oth and it is time for Tap Invasion to be called finished. Here is the link to Tap Invasion. While May will probably see me embark on a month long quest to make a massively multiplayer procedurally generated infinite terrain RPG with exploration, self aware AI, fully original 3D characters, crafting everything in the game, modding and Occulus Rift support. Or maybe a multiplayer Pong clone? I had an initial idea for something with simple controls but Space Invaders-like and I think I’ve accomplished that goal. I got the basic concept up and running in a day! I was happy with my code design allowing me to easily add new enemies and other features. 5 bosses, 5 enemies, 2 power ups – the game feels varied and polished. I really like the soundtrack – but I hope to make my own music someday. Most people who have given feed back say it’s simple to learn and addictive! Making pixel art went pretty well – I think its cool, but who knows what other people think. I may continue this route for my future Space Wars games. I have a lot of cool reusuable code – Top Score Board! I sorta got touch controls to work, but still trying to get Unity Remote to work or get the game on my Android phone. Relearning PHP/MySQL and figuring out how to get it all working with Unity ate up a whole week! Original score board code was super complicated. My game controller object is super bloated. The music is a little memory intense. The game seems to get unbeatable – much better balanced now but could use a little more. Trying to port to Android and iOS may be impossible!? This entry was posted in 1 Game A Month and tagged #1gam, c#, post mortem, tap invasion, unity. Bookmark the permalink. 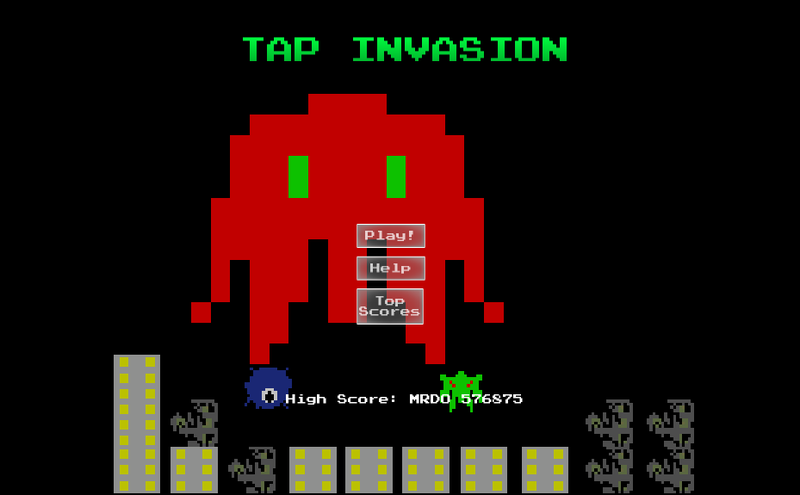 ← Tap Invasion: Now has Top Scores! Who will be supreme champion! ?